New Jersey can claim a ton of firsts and honors, most of them not very flattering (first state to be charged with securities fraud, most maligned state, former toxic landfill center of the universe), but there’s no doubt about one thing: it’s the Taylor ham capital of the world. All Taylor ham is pork roll; not all pork roll is Taylor ham. You can immediately tell a North Jerseyan from a South Jerseyan over the pork roll question. North Jerseyans call pork roll “Taylor ham.” South Jerseyans call it “pork roll.” The dividing line is roughly I-195, although as far as I’m concerned if you don’t recognize Central Jersey as a separate region, you don’t know Jersey. Anyway, good luck trying to tell North Jerseyans there’s a decent chance the “Taylor ham’’ they are eating at their diners and luncheonettes is not made by Taylor Provisions in Trenton, the only company to make Taylor ham. If you’re not eating real Taylor ham, you can’t call it Taylor ham, but North Jerseyans don’t care. It’ll always be Taylor ham to them. But it’s like calling all paper tissues Kleenex, or all copiers Xeroxes. For the uninitiated, Taylor ham/pork roll is a lightly smoked and cured pork product, with spices, salt, and preservatives; its makers have never been forthright into what exactly goes into the stuff. Like pepperoni, it curls up when cooked on the grill. It’s a cousin to ham-like Canadian bacon, which comes from the pork loin (American bacon comes from pork belly). It's usually eaten grilled, in a roll. At most delis, you can get it on a bagel; Bagel Chateau in Westfield, for example, goes through 100lbs of Taylor ham a week. 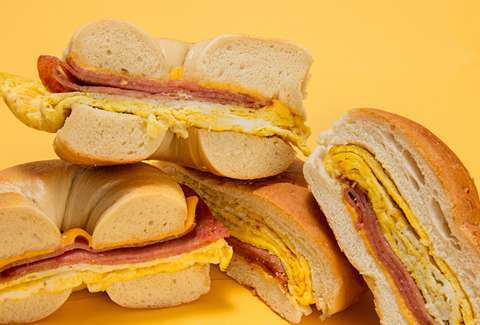 But when it comes to Taylor ham, Jerseyans prefer a roll over a bagel; a Taylor ham, egg, and cheese on a roll is pretty much the state sandwich. There are two major pork roll players -- Taylor Provisions and Case. John Taylor’s Original Taylor Pork Roll dates to 1856; Taylor Provisions, the company, was founded in 1939. George Washington Case began selling hickory-smoked pork roll at his farm in Belle Mead, Somerset County, in 1870. His company, the Case Pork Pack Co., would later become the Case Pork Co. Both Taylor Provisions and Case are headquartered in Trenton, which would make the state capital the center of the pork roll universe. Case calls itself the ”Original Jersey ham,’’ and you can order bags or boxes of the pork roll direct from them; there is no retail location. Taylor Provisions has zero web presence. There are some others as well -- Loeffler’s, also headquartered in Trenton, makes pork roll under its Mercer Meats label, and Thumann’s offers Jersey Made pork roll, which one deli owner told me is less greasy than Taylor ham when cooked -- but none are as big as Taylor Provisions and Case. 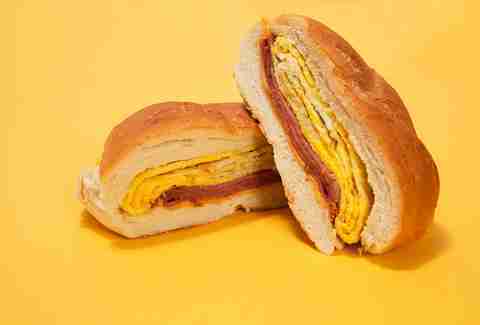 Jerseyans have an emotional connection with Taylor ham/pork roll, unrivaled by any other food -- with the exception of pizza. But pizza you can get anywhere; you’ll be hard pressed to find Taylor ham/pork roll outside New Jersey and eastern Pennsylvania. Food chat boards are full of anguished laments from former Jerseyans who can’t find it where they currently live (many apparently don’t realize you can order it online, from places like jerseyporkroll.com and the taylorhamman.com). Did I mention there’s a Vegan Pork Roll Festival, too? 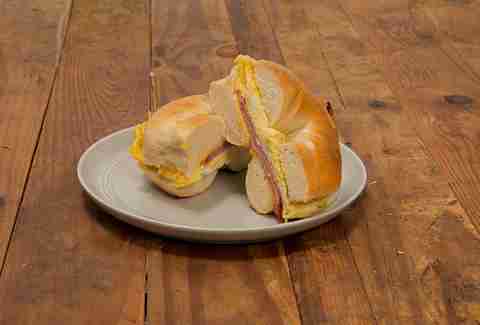 A Taylor ham, egg, and cheese on a roll is pretty much the state sandwich. When I put Taylor ham/pork roll on a list of the 10 Most Overrated Things about New Jersey, the outcry was immeasurable. I emphasized in the piece that I didn’t hate pork roll; I just said it was overrated. I might as well have said taxes should be tripled, or Jerseyans should genuflect every time they walk by a New Yorker. Yes, New Jerseyans take Taylor ham/pork roll seriously. The state’s love for Taylor ham or pork roll is such that Taylor ham burgers (pork plus beef on a bun), Taylor ham pancakes, and other dishes can be found at diners and breakfast spots around the state. Toast in Montclair, for one, offers the Shamewich -- Taylor ham, egg, and cheese sandwiched between two buttermilk pancakes. It’s one of my favorite guilty pleasures. In terms of the regular sandwich, is there one place that's considered the shrine of Taylor ham, egg, and cheese-dom? No, any Jersey deli or diner worth its salt will do a credible version. But of course there are some standouts -- Bagel Chateau in Westfield (for Taylor ham on a bagel); Frank’s Deli & Restaurant in Asbury Park (a big meaty sandwich in a priceless retro atmosphere); Fredon Deli in Fredon (for a Taylor ham sandwich with particularly fresh-tasting eggs); the Olde Towne Deli in Boonton (winner of a statewide Taylor ham/pork roll sandwich showdown I did in 2014); the Summit Diner in Summit (the state’s oldest diner, where Taylor ham sandwiches are called “sliders’’); the White Rose Diner in Linden; and the Allenwood General Store in Wall, where you can enjoy your pork roll sandwich in a wood-floored general store that also doubles as an antiques shop jammed with steamer trunks, vintage records, old magazines, tools, typewriters, and tons of other... stuff. Truthfully, I still think Taylor ham/pork roll is overrated -- bacon has so much more going on taste and texture-wise -- but that doesn’t mean it won’t always be a Jersey icon. 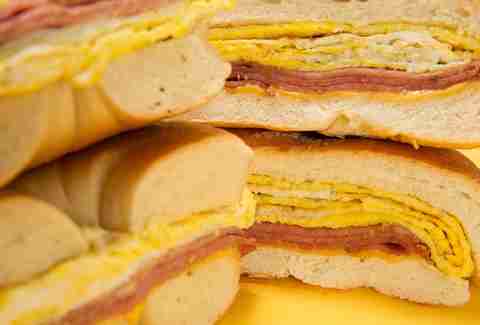 The Taylor ham/pork roll sandwich will always come first in the hearts -- and stomachs -- of New Jerseyans. Peter Genovese is a features/food writer for NJ.com and The (Newark) Star-Ledger. He is the author of 10 books, including Jersey Diners and Pizza City: The Ultimate Guide to New York’s Favorite Food. Follow him on Twitter and Instagram.